Blizzak LM-32 RFT winter tires feature Bridgestone's latest performance winter compound technology molded into a directional tread design to combine hydroplaning resistance on wet and slush-covered roads with confident grip and braking traction in cold winter conditions. Rounded shoulders enhance dry and wet road handling while independent tread blocks employing the Lamellen "edge effect" (multiple biting edges in the tread blocks to help grip snow and ice) enhance winter traction without resorting to traditional metal studs. This allows Blizzak LM-32 RFT tires to combine winter traction, H-speed rated capability and the extended mobility available from run-flat tires. Blizzak LM-32 RFT winter tires meet the industry's severe snow service requirements and are branded with the mountain/snowflake symbol. 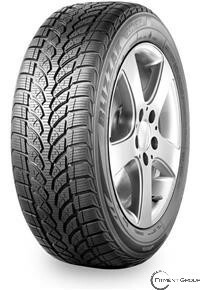 NOTE: Snow platform indicators (the equivalent of snow wear bars) are molded into the Blizzak LM-32 RFT's tread grooves to inform the driver when ice and snow traction will be reduced as the tire's treadwear reaches the point where the remaining tread depth becomes less effective in deep snow.